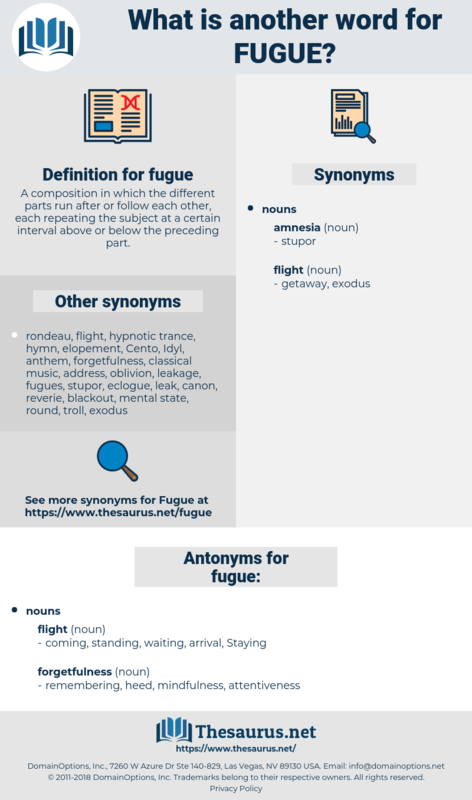 What is another word for fugue? A composition in which the different parts run after or follow each other, each repeating the subject at a certain interval above or below the preceding part. coming, standing, waiting, arrival, Staying. 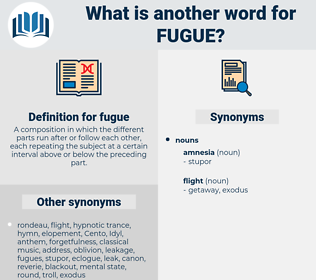 Gradually the right hand was added, and regardless of his awkward position, the fugue developed in all conceivable manners for the space of half an hour, when he suddenly awoke to discover that his pupil was still in his place before the pianoforte. The King next requested him to play a six - part fugue, and Bach extemporised one on a theme selected by himself. classical music, classical, serious music. mental state, psychological state, psychological condition, dissociative disorder, mental condition.